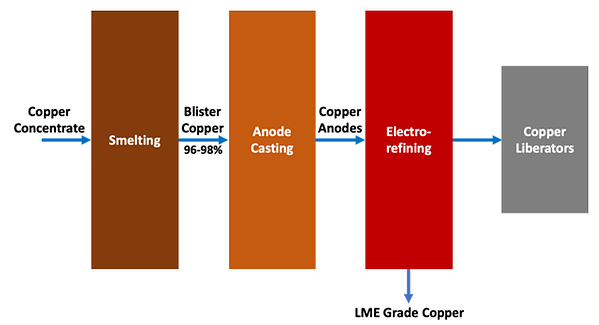 The electro-refining of copper is a multi-step process that starts with copper concentrate that is smelted to produce impure copper anodes, which are then electrorefined to produce LME Grade A copper cathode (+99.99%). A simplified block flow diagram of copper refining is shown below. A key aspect of copper electrorefining is the control of copper concentration and impurities in the electrolyte. The dissolution of copper at the anode is inherently faster than the electroplating of copper at the cathode, hence copper tends to build up in the electrolyte and needs to be controlled. Without a proper electrolyte “bleed”, the copper would continue to build up along with impurities such as arsenic, antimony and bismuth which are present in the impure copper anode and can affect the purity of the final product. This process of controlling copper and impurities in the refinery electrolyte is known as “liberation” and the electrowinning circuit used for this process is commonly referred to as a “copper liberator”. They produce an impure cathode, which must be recycled resulting in increased working capital, and reduced profitability. There are serious health and safety concerns from the acid mist and potential for arsine generation. The formation of copper liberator sludge which collects at the bottom of the liberator cells and must be manually removed which is labor intensive and a serious health and safety risk due to the high arsenic and antimony. A significant advancement in copper liberator technology involves the use of emew electrowinning to control copper in the refinery bleed. 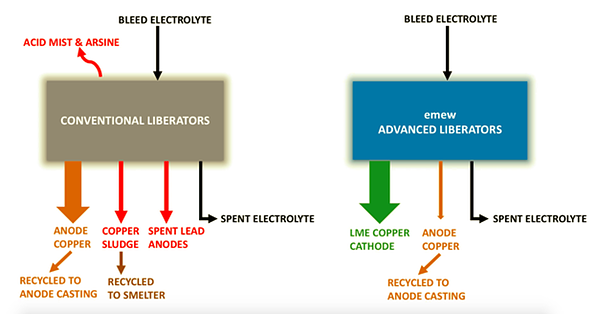 Using emew advanced liberators, LME grade copper cathode is produced in a closed cell with no acid mist, no arsine, no lead anodes nor any copper liberator sludge. 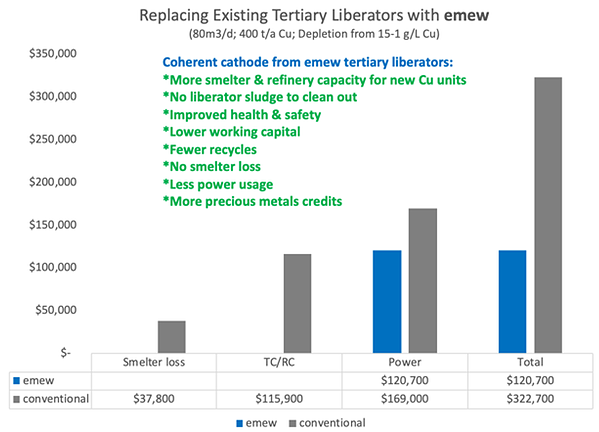 The schematic below compares emew advanced liberator technology with conventional electrowinning. The investment to upgrade an existing electrorefinery from conventional to emew electrowinning technology must be justified based on an empirical cost-benefit analysis. Let’s take a look at a typical application. A copper refinery bleeds 80m3/day of electrolyte to conventional liberator cells. The refinery operates a multi-stage liberator circuit that depletes the copper in the electrolyte from 45 g/L down to 1-3 g/L in three stages. The first or “primary” stage of copper liberation depletes the copper from 45 g/L to 30 g/L, a ‘bite’ of 15 g/L. The “secondary” stage of copper liberation depletes the copper from 30 g/L to 15 g/L, while the third or “tertiary” stage of copper liberation depletes the copper from 15 g/L to 1-3 g/L. The refinery has undergone several upgrades and optimization projects over the years and is now able to produce saleable LME grade copper cathode from their primary liberator circuit. The copper from their secondary liberator circuit is recycled to the anode furnace, whereas the copper sludge produced from their tertiary liberator circuit can only be recycled back to the smelter. Refinery management is concerned with the health and safety of the tertiary liberator circuit due to monthly refinery evacuations from arsine alarms, extreme personal protective equipment (PPE) required by operators to clean the copper sludge from the cells, not to mention the low current efficiency and high working capital. The refinery manager contacted emew about upgrading their tertiary liberator circuit to emew. She is sold on the health and safety benefits of emew compared to her current tertiary liberator circuit, but she must justify her proposed capital expenditure to the General Manager. In order to receive approval, she needs to demonstrate a two-year payback and reduced operating costs. The capital expenditure for an emew tertiary liberator circuit to treat 80 m3/day of electrolyte depleting copper from 15 g/L to 1-3 g/L is USD 881,200. The tertiary liberator circuit recovers just over one metric tonne (1145 kg) of copper daily, all of which is currently recycled back to the smelter. This recycle obviously has an impact on the new copper units that the smelter can process. That is to say, by treating this ongoing copper recycle from the tertiary liberator cells, the smelter (which has a fixed throughput capacity) is constrained in the amount of new copper units (as copper concentrate) because it has to keep up with the copper already in process. Without processing the ongoing production of tertiary copper sludge from the electrorefinery, it will continue to build up. These recycled copper units contribute to working capital. Assuming a daily recycle of 1145 kg of copper, 60 days reprocessing time, and LME copper price of USD 6250/tonne, the working capital of this recycle amounts to USD 431,000. Recovering this copper as saleable cathode with emew and not recycling to the smelter, the savings in working capital offset the capital expenditure resulting in a net capital investment of just USD 450,200. Working capital is just one impact of the recycle of the tertiary copper sludge, however copper refineries also charge what are known as Treatment Charges (TC’s) and Refinery Charges (RC’s). TC/RC’s are intended to reflect the cost to convert a tonne of concentrate into metal, are negotiated annually each year and are deducted from the payable copper price to mines. TC/RC’s represent a cost to a mine, whereas a revenue for a smelter/refinery. If a smelter/refinery is not collecting TC/RC’s for processing a given quantity of copper, then they are losing out on this revenue that would have otherwise been collected from fresh copper units as concentrate (not to mention precious metals credits from concentrate). Let’s take a look at the impact of the tertiary copper recycle on TC/RC revenue, as well as low current efficiency and what is known as ‘smelter loss’. Assuming current TC/RC’s of $90/tonne and $0.09/lb, this works out to USD 115,831 annually in lost revenue from TC/RC’s by recycling the tertiary copper sludge. Furthermore, the recycle of copper to the smelter inevitably results in some smelter loss which is typically 1.5-2%. We have assumed 1.5% smelter loss at a cost of USD 37,706. Lastly, the current efficiency in conventional tertiary liberator circuits is notoriously low. We have assumed 50% current efficiency in the tertiary liberators with conventional electrowinning, compared to 90% with emew. The effect of these parameters on annual operating cost can be seen in the diagram below. 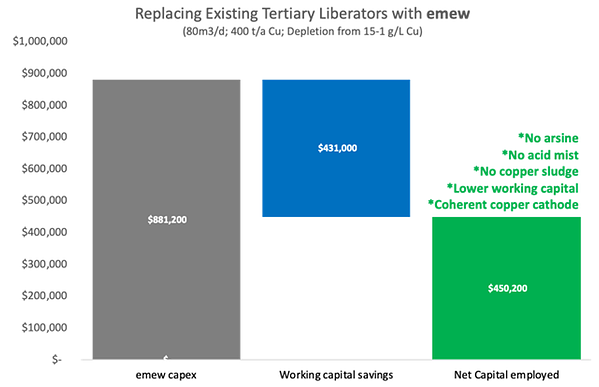 Overall emew tertiary liberator cells require roughly 40% the cost to operate compared to conventional liberator cells, not to mention the host of other benefits. This case is even more compelling if the current liberators need to be upgraded or there are tougher Occupational Health requirements.